Brazil have won their South American sevens title, and a place in the World Cup. Brazil’s remarkable run in the South American sevens continued this weekend as they lifted their 13th South American title in 13 attempts (they did not take part in 2015). They have still never lost a match (played 70, won 70), average over 30 points per game (2,372 points), and on average concede less than two (124 against - so roughly a try conceded every three games). Slightly confusingly, this was also their second South American Championship win in 2017, with the Championship brought forward to the annual Valentín Martínez tournament, in Montevideo, Uruguay, so as to meet the timetable requirements of the World Cup. Only sevens teams took part - Colombia and Venezuela absent from the usual line-up, but with Costa Rica joining in. As a resut the "Yarras" will compete in their third Rugby World Cup 7s - after playing in Dubai 2009 and Moscow 2013 - and will also travel to Langford in for the Canadian round of the World Series, and will also take part in the World Series qualifier in Hong Kong, alongside runners-up Argentina who finished second position for the 10th time. 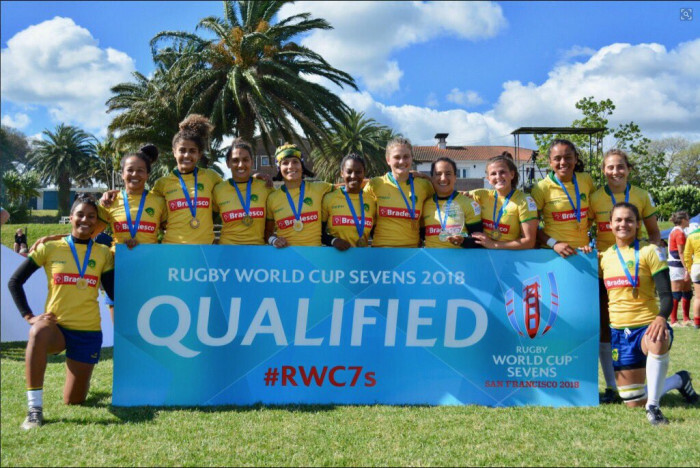 The Yarras, lead by veterans Paulinha Ishibashi and "Baby" Futuro, scored 245 points in their six matches, receiving only one try from Paraguay and two from Argentina in the closing match, which defined the tournament when both came Undefeated teams. The sunshine at the Carrasco Polo Club showed the usual dominance of Brazil, and (especially with Colombia absent) Argentina. The surprise team was Peru, who finished third (having never previously finished better than sixth) while Costa Rica, who did not win a match, took the Fair Play trophy. The tournament was run as a single pool, with no final, but the final pool game was the decider between Brazil and Argentina. Brazil's Sofia Gonzalez - player of the tournament - scored first in the opening minute, shortly followed by Futuro. Two minutes later, captain Isadora Cerullo scored try but Argentina replied with a try from the speed of Valeria Montero, and then another to go to the break with Brazil leading 17 to 12. In the second hald Bianca Silva scored for Brazil to ensure their place in San Francisco.